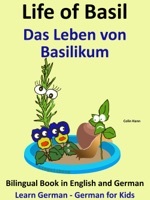 This illustrated free bilingual book is for bilingual children and German language students with a basic or intermediate knowledge who want to study a dual language text in English and German. For ease of understanding, the languages are displayed together mostly one or two sentences at a time. The aim was to make the translation as direct as possible but always using everyday language of native speakers. Reading this entertaining dual language book will help you develop your knowledge of the German language. Basil finds himself in a strange new pot and meets our other chatty little plants. They think they know some stuff, but when it comes to animals, they know nothing. One wild assumption followed by another gets them into big trouble. Next time they may not be so lucky! The first thing in his life that Basil remembered was cold air. A little girl put Basil's pot down on the front door step. Das Erste, woran sich Basilikum in seinem Leben erinnerte, war die kalte Luft. Ein kleines Mädchen stellte Basilikums Topf auf die Stufe vor der Haustür. Next to the front door he saw a big flowerpot. It was bright blue and on it was painted a picture of an orange cat. "What a scary animal!" thought Basil. Neben der Haustür sah er einen großen Blumentopf. Der Blumentopf war leuchtend blau und darauf war ein Bild von einer orangefarbenen Katze gemalt. „Was für ein unheimliches Tier!“, dachte Basilikum. Learn Spanish: Spanish for Kids. Bilingual Book in English and Spanish: Pig - Cerdito.